Every Holiday Squad – Rode Work (2017). Installation view at the group show “Rode Work” curated by Side Core for Reborn-Art. Festival (Sakanamachi, Ishinomaki). Photo Shuji Goto, courtesy Side Core. As was the case in 2016, a surprisingly large number of “art festivals” were held in various parts of Japan in 2017. Though I could not make it to all of them, I would like to take this opportunity to share my impressions of a few individual examples as part of a wider review of the domestic art scene in 2017. I will be focusing on three art festivals, listed here in the order in which I saw them: Reborn-Art Festival 2017 (July 22 to September 10), the Sapporo International Art Festival (August 6 to October 1), and the Yokohama Triennale (August 4 to November 5). I also saw several others, but for convenience’s sake I will limit my discussion to these three. The first thing I would like to focus on is that, in spite of the fact that in terms of their content these three “art festivals” are all “international art exhibitions,” there are subtle differences in their Japanese titles, with the first being referred to as a “festival” (in katakana), the second an “art festival” (geijutsusai) and the third a “triennale.” What might the reasons for this be? These contrasting natures of the two major events that marked the first year of “art festivals” in Japan meant that from the outset they took on the two completely different characteristics of town (internationality) and country (rootedness). An example of something in a similar vein to the former would be the Aichi Triennale in Nagoya, which is centered on another large city (Nagoya) and was first held in 2010, while an example of something in a similar vein to the latter would be the Setouchi Triennale, which is held on a number of sparsely populated islands scattered between Kagawa and Okayama Prefectures and was also first held in 2010. Another thing that should probably be noted at this point is that Akira Tatehata was one of the artistic directors of the inaugural Yokohama Triennale and the first art director of the Aichi Triennale, while Fram Kitagawa has been the general director of any number of “art festivals” staged across sparsely populated mountain villages or islands. Tatehata was also the artistic director of the Culture City of East Asia 2017, Kyoto: Asia Corridor Contemporary Art Exhibition (August 19–October 15) (1), which attracted attention on account of it being held at Nijo Castle, in light of which he could be regarded as a typical urban art festival director. In this respect, there are considerable differences between Kitagawa and Tatehata concerning their approach to art festivals. Let’s consider these contrasting natures from a different angle. Because the onus is on the urban art festivals known as “triennales” that set forth, even if only for show, the internationality inevitably demanded of contemporary major cities to send some kind of message to the outside world that is not limited to internal regional development, there naturally tends to be an emphasis on theme (message). On the other hand, at “art festivals” founded on rootedness, regardless of what is presented, the emphasis tends to be on regional development. For this reason, there is no requirement for the transmission to the international art world of the kind of conceptual message that is demanded of large-scale international contemporary art exhibitions in the West. In fact, at none of the various art festivals directed by Kitagawa, including both the Echigo-Tsumari Art Triennial and the Setouchi Triennale, is the practice of using a different title each time adopted. 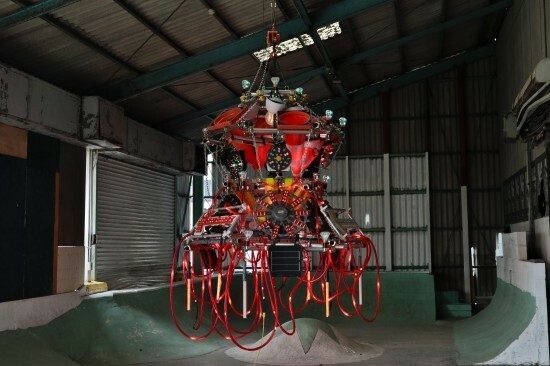 This is because words like “Echigo-Tsumari” and “Setouchi” (conjuring images of rural-natural areas and an inland sea respectively) themselves have more than enough real strength to take the place of conceptual themes, so to add to them would be akin to adding a fifth wheel to a carriage. On the other hand, in the case of art festivals in urban areas, words like “Yokohama,” “Aichi,” “Sapporo” and “Saitama” alone serve only symbol-like functions, meaning separate titles are required. Ujino – Plywood Shinchi (2017). 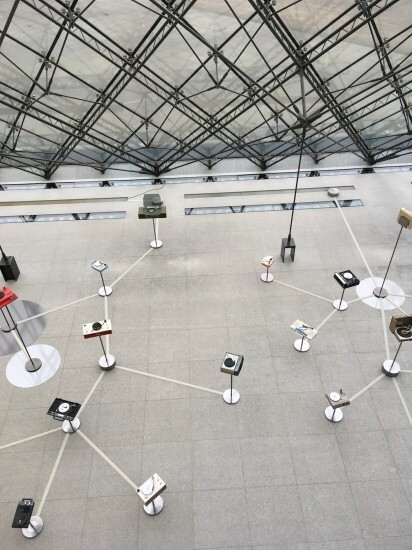 Installation view at the Yokohama Triennale 2017. Photo courtesy of the writer. Let us now look back at 2017’s festivals based on these framings. First, though the latter is referred to as an “art festival,” it goes without saying that both the Yokohama Triennale 2017 (hereinafter Yokohama) and Sapporo International Art Festival 2017 (hereinafter Sapporo) are urban international contemporary art exhibitions. Accordingly, they naturally require additional titles. This time around, Yokohama’s was “Islands, Constellation & Galapagos” (co-directors: Akiko Miki, Eriko Osaka, Tomoh Kashiwagi) and Sapporo’s was “How do we define art festival?” (guest director: Yoshihide Otomo), and while visitors could encounter excellent artworks as part of the individual exhibits, to be frank it was difficult to find works that provided opportunities to think about anything related to the titles, and in fact it was difficult to understand the relationship between the titles and the individual exhibits. Perhaps this was why in the case of the latter the subtitle “When Bits and Pieces Become Asterisms” (which seems more suitable as a title) was added, which strangely enough overlapped with Yokohama’s “constellation.” Of course, this could not have been by arrangement. Rather, it would seem to be a case of the word “asterism” naturally coming to mind as a convenient, magical word of last resort when trying to tie together a large-scale art festival with a single title. 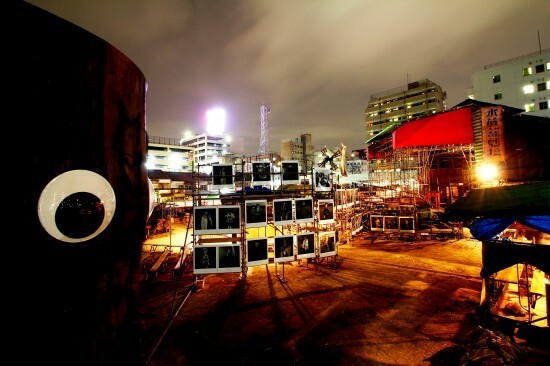 Installation view of “Out of Triennale – Thieves’ Lunar Park” at the Kotobuki-cho Workers’ Welfare Hall redevelopment site (August 3 to September 17, 2017), held side by side with the Suizokukan Gekijo play This World-like Dream: Final but Unfinished Kotobuki Version (September 1-5 and 13-17). Both were planned as Yokohama Programs in conjunction with Yokohama Triennale 2017. Photo courtesy Suizokukan Gekijo. Related to this is the fact that at Yokohama I sensed that the decision to confine the majority of the exhibits to the Yokohama Museum of Art and the Yokohama Red Brick Warehouse – so as to more clearly permeate the entire triennale with, and encourage viewers to discover/consider, the theme of “Islands, Constellation & Galapagos” (the meaning of which was given as “Thinking about the world through ‘connectivity’ and ‘isolation'”) – was in fact at odds with the key theme of “connectivity” (to say nothing of “isolation”). Being staged at around the same time were such valuable programs as “Multiple ways to encounter the other – Koganecho Bazaar 2017” and the “Out of Triennale – Thieves’ Lunar Park” exhibition at the Kotobuki-cho Workers’ Welfare Hall redevelopment site (held side by side with the Suizokukan Gekijo play This World-like Dream: Final but Unfinished Kotobuki Version), both of which dealt with difficult problems peculiar to large cities like Yokohama at venues that truly wanted to be “connected” to the outside but were “isolated.” Even if it may have been difficult to incorporate them into the official program, if more had been done to link or advertise them or if at least they had been included in the guidebook handed out at the main venues, then it would probably have been possible to more successfully highlight and bring to life the title. In particular, I heard that more than a few people who visited Yokohama during the Triennale went away without hearing about Suizokukan Gekijo or “Out of Triennale.” From a personal point of view, given that of all the programs I saw in Yokohama during this period these were the most stimulating, I can only say that this is regrettable. You will probably have noticed that I have mentioned hardly anything at all about the actual contents of these art festivals. Of course, this is intentional. Because it is clear that criticism of recent art festivals, which are so numerous one even hears it being said that the country is being flooded with them, at the level of which art festival was good or which exhibit was good or bad is all but meaningless. Rather, the key to their success or failure comes down to such questions as whether in terms of their make-up they are town (urbanity) or country (rootedness), why the former requires a title and the latter does not, why in the case of the former the decision over the title involves arguing to no point, and why in the case of the latter the name of the location can take the place of a title. Until we examine this matter thoroughly, won’t our criticism of all these art festivals amount to nothing but the same kind of arbitrary “judging”? 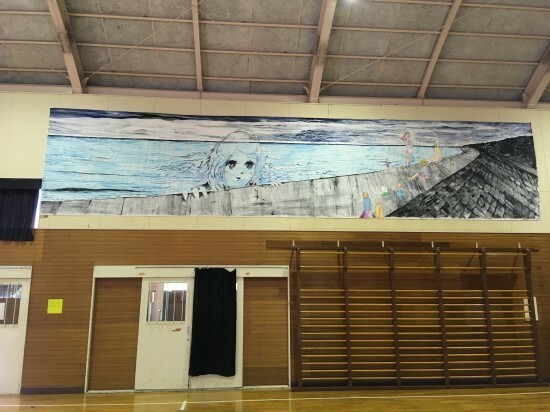 Parco Kinoshita – Return of the sea (2017), 200 x 1000 cm. Installation view at Reborn-Art. Festival (former Ishinomaki Oginohama Elementary School, Ishinomaki). Photo: the writer. In this sense, too, we need to quickly mention the Reborn-Art Festival 2017 (hereinafter Reborn), which was held over a wide area encompassing central Ishinomaki, the area directly affected by the 2011 tsunami, and the Oshika Peninsula, which was the closest part of the Japanese archipelago to the epicenter of the earthquake that triggered the tsunami. Earlier I mentioned that since 2000-2001, art festivals in Japan have broadly fitted into two categories, but the Japanese title of Reborn bears not the Japanese equivalent of either “triennale” or “art festival,” but simply “festival.” As this suggests, Reborn is above all worthy of attention as a fresh attempt to stage a different kind of large-scale art festival outside of the aforementioned categories. For a start, Miyagi Prefecture, Ishinomaki and the other venues are only the “co-hosts.” The “hosts” are the Reborn-Art Festival Executive Committee and AP Bank. In other words, it is almost purely a privately led art festival. Considering that the other art festivals mentioned here are essentially all based around public enterprises (though there are various differences in degree), this is rather exceptional. Speaking of “exceptional,” in the sense that it was an art festival held in a place where so many people died (including those who died or remain missing as a direct result of the disaster as well as related deaths, Ishinomaki suffered nearly 4000 casualties), Reborn is unprecedented. As well, Takeshi Kobayashi, who is one of the two chairpersons of the Executive Committee and essentially the leader as chairperson of the Production Committee, is a music producer and not the kind of expert in contemporary art that usually leads such art festivals (true, Kobayashi did have the support of Koichi and Etsuko Watari of the Watari Museum of Contemporary Art as effective curators, but Watari-um is still a private museum). (2) And so Reborn was an art festival that was unconventional in the three respects that is was privately led, held in an area affected by a major disaster area, and run by someone who was not an art expert. Yoshihide Otomo + Takayuki Ito – (with) without records (2017). Installation view at the Sapporo International Art Festival 2017 (Moerenuma Park). Photo: the writer. Mind you, in terms of a musician serving as director, Sapporo, where Ryuichi Sakamoto was appointed guest director for the first festival and Otomo for the second held in 2017, led the way. In other words, around the same time in 2017, art festivals in which musicians (or music producers) played leading roles in the planning were held in the most important major city in the country’s north and a major disaster area in the process of recovering, one as a public enterprise and one led by the private sector. The thing these two festivals have in common, and the reason they deserve attention, is, as should be obvious if one considers how for some time now “festivals” have been so popular in the music world (which is probably why Reborn has the word “festival” in its title), that they are attempts to flexibly reassemble the framework of previous art festivals as international contemporary art festivals run by art experts based on the temporariness and formlessness of the festivity and extemporaneity of music and the flexibility of ensembles. However, unlike so-called rock festivals, art festivals often run for several months, and dealing with this while at the same time incorporating improvisatory elements will inevitably give rise to difficulties that are essentially different from those that arise in the field of music. In the sense that despite all these difficulties, suddenly appearing and disappearing impromptu events continued over a long period, many surprise musicians flew in from Tokyo and gave intimate performances, and there were ongoing prospects for programs run autonomously by people affected by the disaster even after Reborn ended, I think the critical formal challenge Otomo issued to existing art festivals and triennales at Sapporo in the form of the question, “How do we define art festival?” was more substantially brought to life at Reborn under the direction of Kobayashi. Unfortunately, of the “art festivals” I saw in 2017, the Asia Corridor Contemporary Art Exhibition held at Nijo Castle was the most disappointing. Despite the organizers having the unprecedented opportunity to display contemporary art at Nijo Castle, the results did not go beyond the level of using the grounds of Nijo Castle as a venue to install artworks, and it was impossible to find any evidence of curation driving artists and artworks. In addition, though it may have occurred only on the day I visited, the display of several key artworks was cancelled for unknown reasons, leaving me unable to even see them. Having said that, I was satisfied to some extent with Kodai Nakahara’s exhibit at the other venue, the Kyoto Art Center, which (given the venue was formerly an elementary school) consisted of drawings he made as a child arranged one next to the other across several rooms. 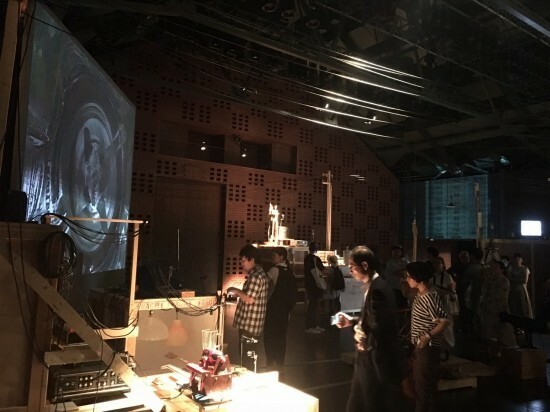 It was held thereafter as the exhibition “Reborn Art Festival in Tokyo” from October 20 through December 30 at the Watari Museum of Contemporary Art.